Solbox(Park Taeha/CEO, www.solbox.com), a leading content delivery network(CDN) services and video delivery solution provider in South Korea, announced that they contracted with KT(Hwang Chang-Gyu/CEO, www.kt.com) to introduce new CDN service that provides optional customized CDN service features for better customer satisfaction. This add-on CDN service is targeting at existing or new CDN customers who need enhanced service features such as p Transcoding p Ad Insertion p Multiplayer p DRM p Image resizing and other customized service requirements. The CDN customers can have different options to choose among each service package. It offers many benefits including easy and fast service management and operation, maximization of profitability, minimum investment cost while delivering high-quality media contents to Internet users. 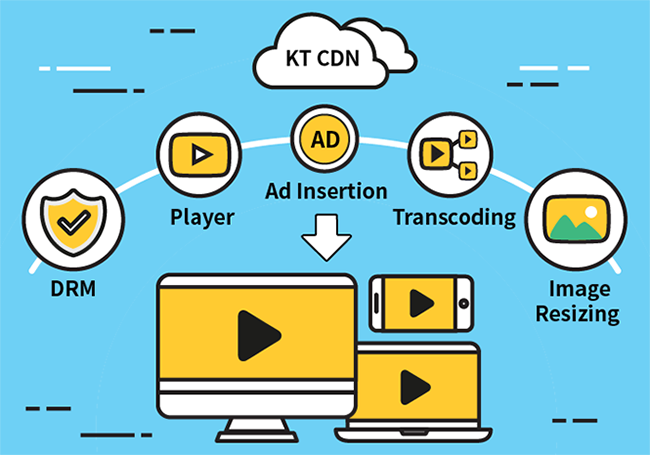 One of the key features of the KT’s Add-on CDN service is transcoding, which allows changing video/audio codec, video resolution, audio volume, framerate, bitrate and it can done according to customer's environment by using Web/FTP/API. Using this service does not require additional hardware platform and software license so it can significantly save the cost for investment and operation on CDN customer’s side. At the same time, it guarantees the best digital content delivery service to online users. For example, the customer optionally choose different service feature such as DVR(digital video recording) to record real-time video stream content and File Live service to manage broadcast scheduling by day and time. For content security, DRM feature provides copyright protection by preventing the illegal alteration or duplication of the original VOD content and live streaming video by supporting multi-DRM without using a plugin for web browsers. For customer who use old OS or existing media content players, the service comes with SDK development package to fit mobile and PC user environment as well. For greater service flexibility and scalability, the multiplayer feature supports HTML5 to provide high-quality digital media contents to any user devices such as PC, IPTV, mobile, tablet over different OS environments. Also, it allows Internet users to enjoy online video content regardless of their device type. In particular, CDN customers can insert the ad content easily with little development efforts by combining it with the media content in single stream file, which allows putting the ad into any location inside their video content frame without the need of SDK and additional plugins. This ad insertion capability provides a high-quality user experience with wide compatibility on any devices. To provide greater integration for a large number of online users and various internet network environments, the image-resizing feature automatically converts the original image into different image formats such as JPEG, PNG, and GIF in real time and provides the optimal image quality. The service operator also can embed watermarks through API. Currently, these service functions have been introduced and implemented as new or optional services to real-time Internet broadcaster, VOD service provider and online shopping mall sites that need video transcoding, image resizing, storage reduction, saving manpower and investment cost. Many existing and newer CDN customers are satisfied with these additional CDN service features and market response is very good so far. Solbox expects that the new CDN supplementary service improve the quality of video contents service based on multiple functions and expandability by cooperating with KT. Also, it is expected to provide copyright protection of original contents, the service stability of delivering digital contents and increase of the advertising revenue, which can make the Internet service companies to grow their business fast. Taeha Park, CEO of Solbox said, "This new CDN service features can meet current market demand for broadcasters and CDN service providers who need to customize their digital media service for different types of Internet users".